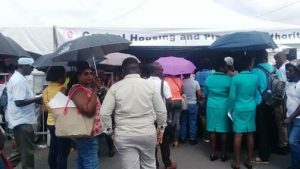 Housing issues dominated the concerns of hundreds of citizens, who swarmed the square of the revolution yesterday at the opening of Government’s first public day. The massive outreach is being conducted at the Square of the Revolution saw more than 22 Government ministries and departments present to assist the public. Here is the latest list of the various Ministries in the Government of Guyana. Information is automatically updated.